Livnica Preciznih Odlivaka (LPO) was founded in 1978 and is based in the city of Ada, Serbia. LPO is an expert in vacuum and air castings of super-alloys and stainless steels for applications such as turbine blades, diffusers and other complex aerospace parts. LPO currently holds certificates for quality regulations including casting of jet engine parts, and special processes including heat treatment, Ni-based castings and mechanic material testing. LPO has been a customer with Nikon Metrology for over 10 years, originally using the LK INTEGRA CMM for its Quality Assurance needs. Due to a recent surge in business activity, LPO decided to expand by introducing a new production hall to capitalise on the demand for its expertise. However, due to the increase in production capacity, its original, solitary LK CMM has taken on double shifts, working at full capacity to keep up with the booming workload. It was recognised that LPO needed to invest in a new quality assurance tool to share the workload, to complement the increased production capacity and to maintain its renowned high quality standards. Miloš Dojčinović in the Purchasing department worked closely with the CMM operators in the decision process to understand what was required of the new system. The ceramic bridge ALTERA CMM is used for plane-line-point measurement in the production of turbine blades for the aerospace industry. Vacuum casting is a way in which metal casters can achieve optimal properties for cast components as well as successfully produce difficult, complex castings such as turbine blades and diffusers. By using a vacuum to draw the molten metal into the mould, the process can be accurately and closely controlled. This process offers an improved quality and finish to the final casting as well as excellent dimensional tolerances compared to pouring. The turbine blades and diffusers produced by LPO are typically NiCo (Nickel/Cobalt) based alloys, formed through the vacuum casting process. Casted NiCo alloy diffuser for an APU (auxiliary power unit) during inspection. Super-alloys are ideal for aerospace turbine components because of their key characteristics – excellent strength and resistance to heat and corrosion which is vital when considering the temperatures and pressures these components will be subject to. When producing these components, there is no room for error as any inaccuracies in geometry or positioning can lead to poor energy conversion efficiency, loss of aerodynamics and in extreme cases, complete failure. Therefore, it is paramount for manufacturers of aerospace components to have a thorough and comprehensive Quality Assurance department using the most adequate technology available. Having noticed a significant increase in the demand for its expertise, LPO recognised the opportunity to expand and grow as a business. The precision casting plant in Ada was working at maximum capacity and it was a natural decision to open up a new production hall. To complement this new and increased production capacity, the Quality Assurance and Dimensional Inspection department was also in need of a revamp. LPO needs to maintain its consistent high quality as well as support the new facility’s increase in throughput. 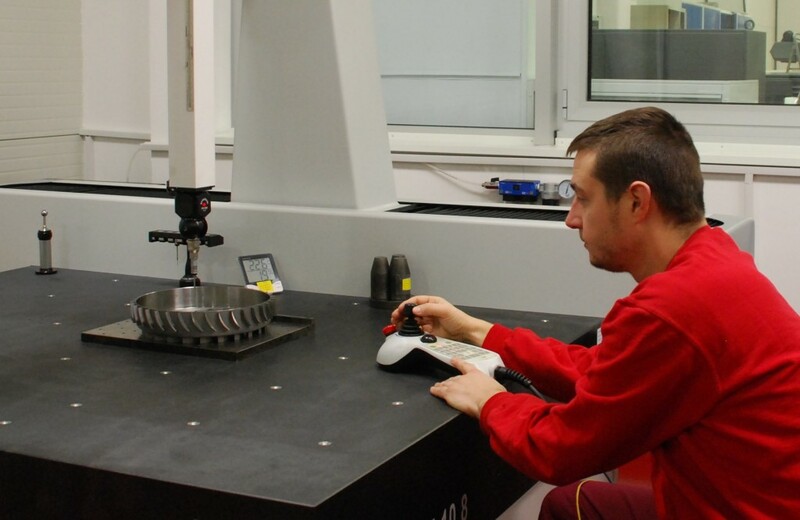 Miloš worked in close collaboration with the CMM operators and analysis led to a step up in size of CMM. Thorough research was conducted prior to selecting the new inspection solution. Both Zeiss and Hexagon were consulted to see which other solutions could match the expectations. 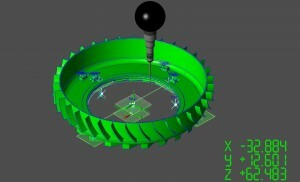 The digital model of the casted NiCo alloy diffuser. Miloš explains, “The operators who originally use the LK INTEGRA prefer the versatility and no-nonsense programmability of the CAMIO software and CAD based part programming. They also aim for the continuity and correct compliance to DMIS standard”. The combination of experience using Nikon systems, the user friendly interface with CAMIO software as well as a good working relationship with the company made the Nikon solution the number one choice. With requirements for the new system being quite similar to the original parameters for the LK INTEGRA, LPO already knew what Nikon CMMs are capable of. The investment in a Nikon CMM with ceramic frame comes with a 10-year structural warranty, meant to achieve and maintain original specified accuracies for the extended working life of the Nikon and LK CMMs. The selected CMM was the 15.10.8 ceramic bridge ALTERA, with TP20 tactile probe and the CAMIO8 software package. Since the installation and training with the new system, Miloš discussed some of the benefits they have seen so far. With the new Nikon ALTERA, we can achieve 100% inspection and are multi-sensor ready for any potential upgrades in the future” – Miloš Dojčinović, Puchasing. Miloš explains how the speed of measurement on the new system is a major benefit for the new facility. On the ALTERA CMM, 100% inspection can now be achieved, to absolutely guarantee individual component conformity. LPO typically conducts plane-line-point measurement of the turbine blades, diffusers (pictured) and other aerospace components, according to customer requirements. With CAMIO, LPO has a better understanding of product conformity with full 3D part-to-CAD comparison and inspection data is easily shared with the click of a mouse. The reports can be exported in various formats to fit each client’s individual needs for data interpretation in a QA department. Miloš adds, that with the ALTERA CMM, they are now multi-sensor ready. Whilst already achieving 100% inspection, if ever the need for multi-sensor technology arises, then LPO is perfectly positioned for a Nikon Metrology Laser Scanning upgrade. Find out more about Nikon Metrology’s CMMs here. Or learn more about CAMIO software, here.